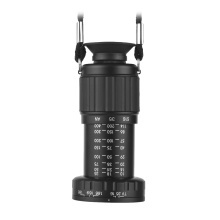 The view finder has a zoom range of 11: 1 and is operated via stretch length of lens, the composition of the scene can be adjusted to fit different situation. Can be used to confirm camera position determination and lens selection, for professional film, TV and video productions ,also suitable for photography. As a necessary equipment for photographers and directors. The proportion of screen space is variable, including TV, 35mm, 16mm, 1:1.66, 16:9, 1:1.85, 1:2.35, 1:2.55, 2/3 inch, 1/2inch, 1/3 inch frame of cameras. Made up of high quality aluminum alloy material, very durable. Mini size design, length of the viewfinder only 6.5cm / 2.5inch, net weight only 119g / 4.2oz, lightweight and portable. With storage bag, cleaning cloth and sling for head, very convenient and practical for use.